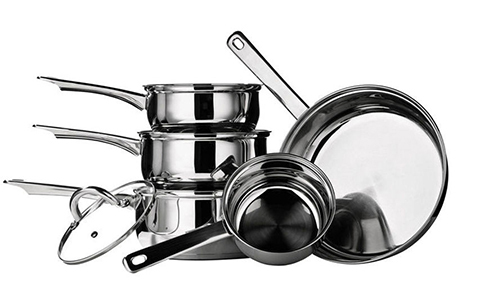 Premier Housewares 17-PCs Kitchen Tools & Stainless Steel Cookware Saucepan Set. Making sure you have the right tools for the right job is key to ensuring you make the perfect meal. With the 12pc gadget set, featuring 5 nylon utensils and 7 stainless steel tools, the set is ideal for kitting out your kitchen with the correct equipment. Each utensil has hanging loops and ergonomic handles with chrome effect detail allowing for easy storage and comfortable grip. 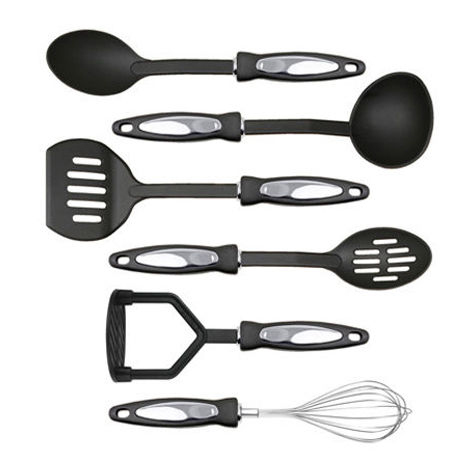 The nylon set includes; Spoon, Slotted Spoon, Ladle, Slotted Turner and Masher. 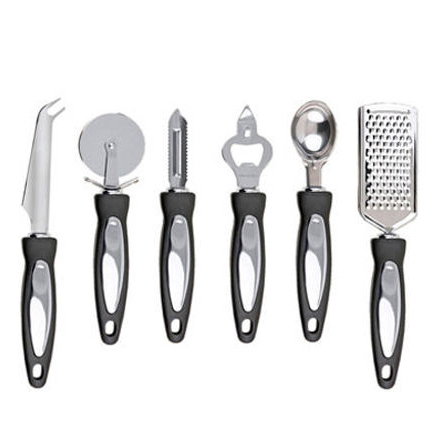 The stainless steel set includes Whisk, Cheese Knife, Pizza Cutter, Peeler, Bottle Opener, Ice Cream Scoop and Grater. With all these tools, the 12pc gadget set is perfect for new homeowners or for those wanting a fresh new look. With the five piece saucepan set you can look forward to creating wonderful homemade meals knowing you have the right pots to do so. The set includes 3 x saucepans, 1 x milk pan and 1 x frypan. The stylish stainless steel not only looks fantastic, but will provide durability for everyday use. Suitable for all hob types except induction, the versatile saucepan is perfect for cooking meats, vegetables, fish, pasta's, soups and sauces. The three saucepans come with a glass lid, stainless steel handles and steam vent so you can check on your food with having to remove the lid until needed, keeping the moisture and juiciness in. Dishwasher safe, the pans will ensure your time won't be taken up cleaning after enjoying a wonderful meal. Stylish and practical, the five piece saucepan set will make a wonderful addition in your home or as a gift.